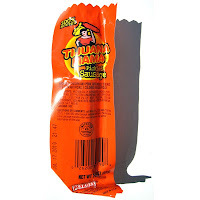 I first reviewed the Tijuana Mama Pickled Sausage back in June of 2006 on my Junk Food Blog. And when I wrote that review, I apparently found a bad sausage, because it broke apart rather easily and was mushy. So now armed with this new blog dedicated to just reviewing beef sticks and snack sausages, I thought to find a better Tijuana Mama and give that thing another chance. Tijuana Mama is produced under the Penrose brand, but is actually a product of ConAgra Foods. You find these things at just about every convenience store at the check out counter. Popular with truckers and travelers, they relieve hunger pains for millions of Americans and keep rest stop toilets busy at all hours of the day. “300% Hotter” is stamped on the package, but 300% hotter than what? It doesn’t say. But that’s been on the package for a long time. So are these things hot? Well yes. There’s indeed some heat to Tijuana Mama, but being someone who loves to eat hot spicy foods, it doesn’t really phase me all that much, but I can certainly feel some burn. Otherwise, the dominant flavor of these mechanically separated chicken and pork parts is a vinegar flavor, along with a weaker chicken sausage flavor. And it does taste like chicken sausage in contrast to a beef sausage. Also the smell of these devilish beasts is horrid. It’s very much like a musty old dish rag that had already been used a hundred times with the last time wiping up some spilled vinegar. I imagine ConAgra has a high turnover rate for the Tijuana Mama Quality Control. And I do have to say this review sample I’m eating here is quite different than the one I reviewed in 2006, not as mushy, and it doesn’t fall apart under its own weight. It has the consistency of a real frankfurter, but just a bit more stiff due to the pickling. 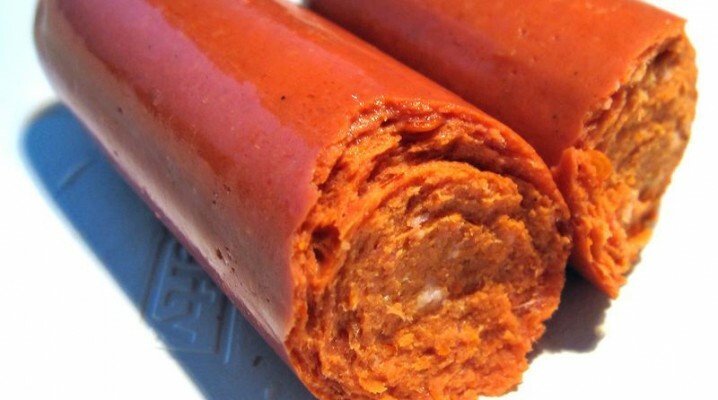 Overall, it packs a lot of salty, vinegar, chicken sausage flavor. 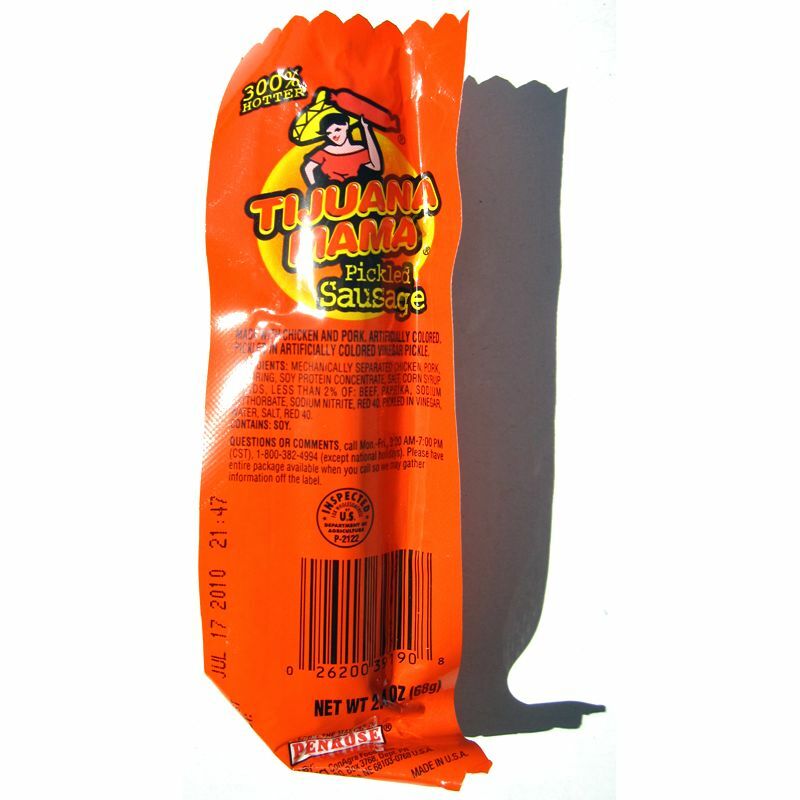 The name “Tijuana Mama” is perhaps quite fitting for this 2.4oz snack stick if you’ve ever visited Tijuana. It’s something you’re better off eating when spending a night alone with a tall bottle of Colt 45 and a full roll of Charmin. A website developer by day and lifelong motorcycle enthusiast, I find a bag a beef jerky and a few beef sticks get me through the day. I'm a computer geek going back to 1981 with an interest in online computing, but I'm also a blogger who loves to write. Maybe you'll catch me on the roads on my motorcycle. Copyright (C) 2009-2014 Clear Digital Media, Inc.